What’s Keeping Investors Away From Energy Stocks? The prices of crude oil and natural gas liquids are much higher than they were a year ago and the outlook for natural gas prices has improved. However, dozens of profitable upstream oil & gas companies are still trading in the lower half of their 52-week range. The money managers on Wall Street either don’t understand how profitable upstream companies are at these commodity prices or they believe oil prices have peaked and are going to fall. First let me say that most investors, let’s call them the “Wall Street Gang”, really don’t understand the upstream oil & gas sub-sector. These are the companies that drill, complete and operate oil & gas wells, which provide the primary energy sources that give us such a high standard of living in the United States. 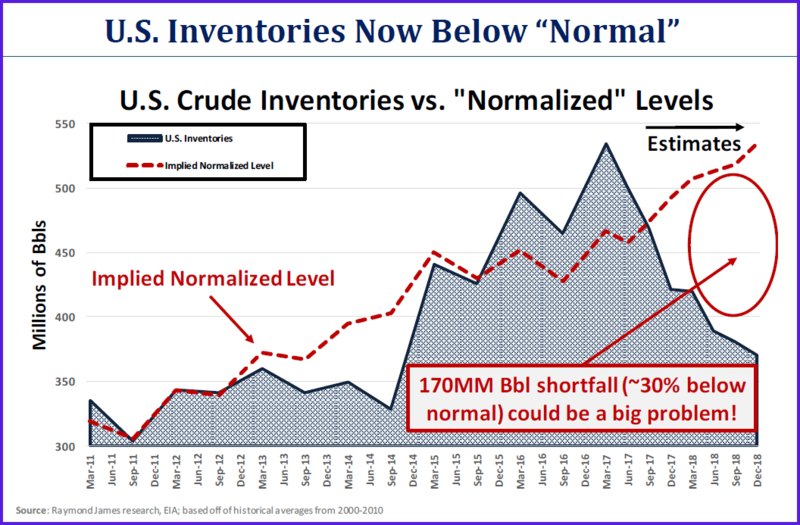 Most investors don’t realize how profitable the business will be if crude oil prices just stay over $65/bbl; not to mention the wealth that will be created if oil bounces back to over $100/bbl. 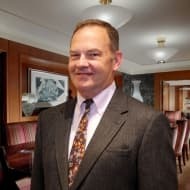 On July 25th I made a presentation in Houston to a room full of energy sector investors were I gave my thoughts on a recent Raymond James & Associates industry update and their oil price target. Raymond James Energy Team, based in Houston, is now forecasting that West Texas Intermediate (WTI) will average $70/bbl during the 2nd half of 2018 and the beginning of 2019. Their “official” long-range price forecast for oil prices are $65/bbl for WTI and $70/bbl for Brent after 2019. “Unofficially”, most of the analysts based in Houston that I talk to think oil prices are going a lot higher. The “Right Price” for WTI is $65 to $75 per barrel, until we see how serious the Trump Administration is about Iran. You can ignore the NYMEX strip; it has never been a reliable forecast of future oil prices. Most of the upstream companies that produce oil & gas will report strong cash flow from operations in 2018 and even higher profits in 2019. Well level economics at today’s oil, gas and NGL prices are as good as they were in 2013 & 2014 when WTI sold for more than $100/bbl. Upstream (drilling & completions) and Midstream activities (gathering, transportation & storage) will remain quite high, which is good news for the oilfield services companies. 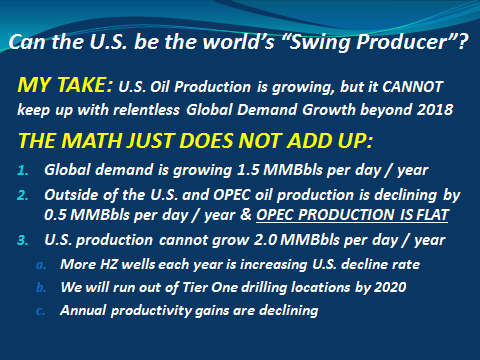 S. oil production will grow to record levels, but the U.S. will never become this world’s “Swing Producer”, responsible for keeping the global oil market stabilized. The price of oil never stays at the “Right Price” for long. Oil price cycles always over-shoot on the downside and the upside, so there is a good chance we see WTI prices spike over $100/bbl within the next twelve months. 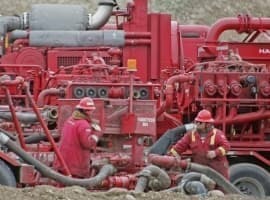 If you agree with me, then you should have a lot of high quality oil & gas company stocks in your portfolio. Demand for oil is increasing about 1.5 million barrels per day each year and non-U.S. / non-OPEC production is declining by approximately 0.5 million barrels per day. 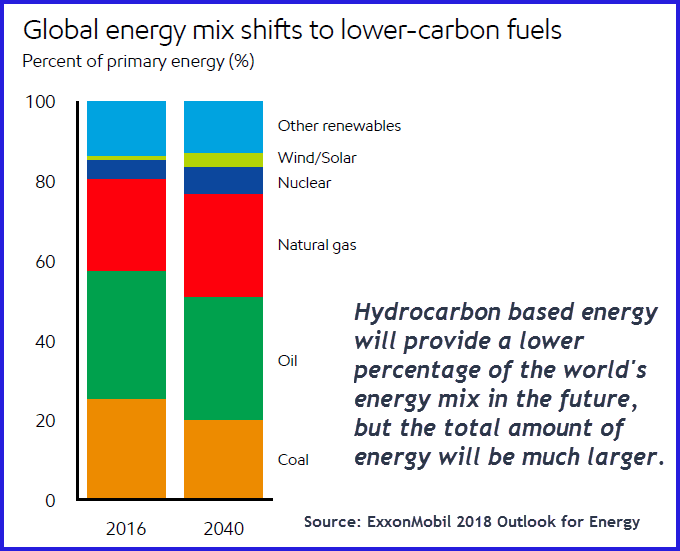 This paints a bullish outlook for the energy sector companies that work in the upstream, midstream and oilfield services sectors. 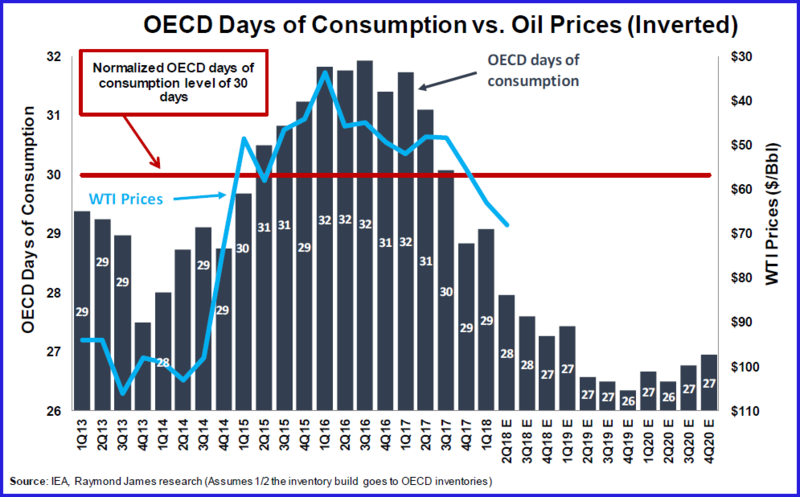 Demand for oil exceeds supply today, which is why OECD inventories are on steady decline. Crude oil prices should stay elevated with supply & demand this tight. However, NYMEX crude oil futures are still in backwardation because of Wall Street fears that appear to be grossly over-rated. The September 2019 NYMEX futures contract for WTI is trading at more than $5.00/bbl discount to the September 2018 contract. It should be noted that the strip has flattened a bit recently. The upstream companies will report strong cash flow from operations in 2018 and 2019 as long as WTI stays over $60/bbl. I follow approximate 50 upstream companies and my forecast models definitely support this belief. Outside of the United States and a few countries in the OPEC cartel, the rest of the world (including Russia) nets to declining supply. The U.S. + OPEC should be able to meet global demand through 2020 assuming WTI remains over $65/bbl. My view is that beyond 2020, it will take much higher oil prices to attract the capital needed to stimulate supply growth. U.S. shale oil production cannot keep growing at the pace it is today. The petrochemical business is booming, which supports strong demand for U.S. natural gas and NGLs. What are investors afraid of? Why hasn’t more money rotated into the Energy Sector? The belief that U.S. oil supply is growing so rapidly that it will overwhelm the global oil market. Fear that the OPEC+ coalition will again flood the global market to gain market share. Lack of an understanding that non-U.S. / non-OPEC production is on decline. This includes the fear that Russia can and will bring a lot more oil to the market. The belief that demand for oil based products is going to decline. On top of these are company specific fears that are beyond the scope of this article. Let’s cover each of these “Primary Fears” one at a time. It is true that oil production is growing in the United States, but the rate of growth will slow after 2018. Without a significant increase in the active drilling rig count, there is no way the U.S. (still a net importer of more than 6 million barrels of oil per day) can meet global demand for oil on its own. Outside of the U.S. all of the other countries net to declining oil supply and this assumes only modest declines in Venezuela and Iran in 2019. 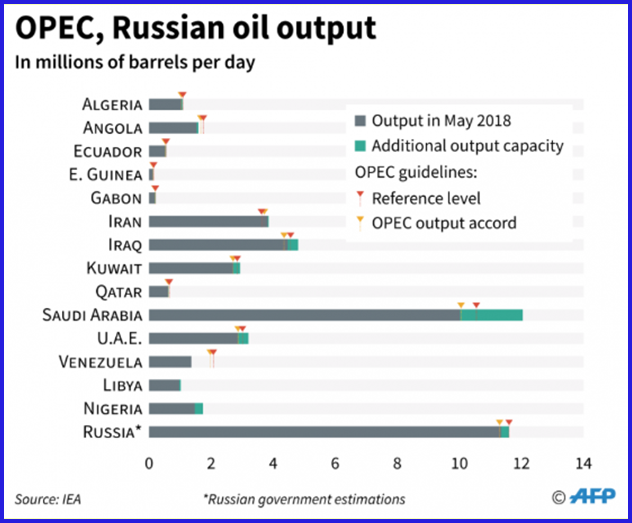 Within OPEC, only Saudi Arabia has significant untapped production capacity and it does not appear that they can offset the declines in Venezuela, Libya, Angola and Iran following the implementation of U.S. sanctions in November. The U.S. cannot keep growing oil production at the current pace (or even close to it) unless there is a significant rise in the active rig count year-after-year. During a July 16, 2018 presentation in Houston, Raymond James estimated that the active onshore drilling rig count in the U.S. would need to increase by more than 200 next year in order for the U.S. to duplicate the 2018 production growth in 2019. I don’t think it is possible because the onshore drilling companies don’t have a lot more high end drilling rigs sitting around and they won’t build them without long-term contracts. The U.S. active rig count must grow each year because the nation’s annual depletion rate is increasing as we layer on more and more high decline rate horizontal wells. Today, the high end rigs don’t exist to do the job. I believe that 2018 will be the PEAK year of oil production growth in the U.S.
Saudi Arabia: The Kingdom’s claim that they have remaining production capacity of 2 million barrels per day is a myth. It would take an aggressive drilling program and lots of new infrastructure to push their production up to 12 million barrels per day. Raymond James’ (RJ) base model for 2018 to 2020 global oil supply & demand is that Saudi Arabia’s actual production will average 10.3 million barrels per day thru 2020. Saudi’s recent increases in exports are the result of draining storage tanks and cannot be sustained for long. Venezuela is a “Failed State”: RJ’s base assumption is that Venezuela’s production goes from ~1.3 MMBOPD in Q2 2018 to ~0.9 MMBOPD in Q4 2019. I’ve had some smart people tell me that Venezuela’s production could go to zero if there is a military coup and the chances of that happening goes up each day. PDVSA, the government’s oil company, recently announced that two of their four oil upgraders had to be shut down for maintenance. This will take several 100,000 barrels per day off of the market. Libya is another wildcard. RJs base assumption is that Libyan production holds at ~1.0 MMBOPD. My view of Libya is that it is a failed state much like Venezuela. It is a country run by lawless gangs. As we have seen several times over the years since Moammar Kaddafi was killed in 2011, a significant amount of Libyan oil production can be taken off the market without notice. Anyone counting on a steady flow of oil from Libya has not been paying much attention to the news from North Africa. Iran: RJ’s base assumption is that President Trump’s sanctions against Iran will take ~210,000 BOPD off the market. Obviously, this is a wildcard and the actual amount could be a lot higher. My opinion is that Trump is serious about Iran and the U.S. sanctions will take more than 1,000,000 BOPD off the market in early 2019. 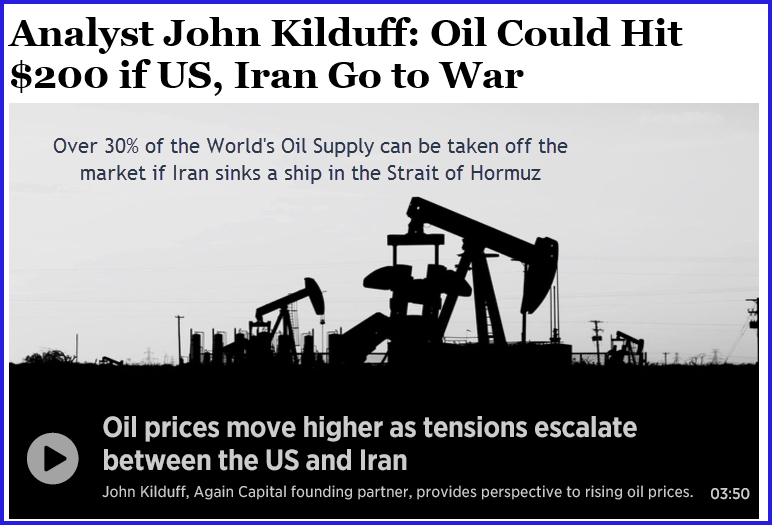 Direct military conflict between the U.S. and Iran will quickly push oil over a $100/bb. Russia is not a threat to oversupply the oil market that many on Wall Street believe it is. In November, 2016 they “drained the tanks” to artificially jack up production before the Vienna Agreement. Russian growth will be ~125,000 BOPD per year. 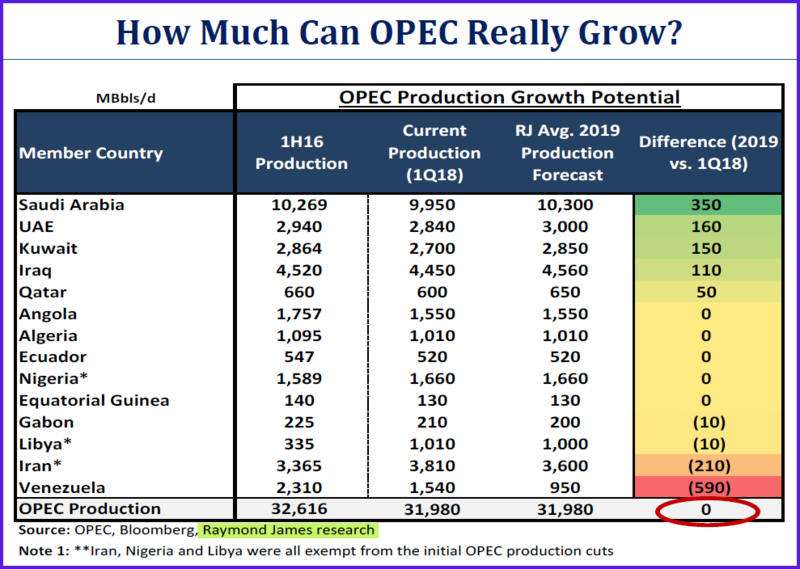 In Summary: OPEC+ cannot increase production even if they wanted to do so and it is certainly not in their best interest to do anything that will lower oil prices. Investors often forget that outside of the U.S. and OPEC the “Rest of the World” produces more than 40% of global oil supply. Most of the countries don’t produce enough oil to meet their own demand and, like the U.S., they are heavily dependent on imported oil and refined products. Lack of investment in large exploration & development projects since early 2014 has pushed completion dates of many Non-U.S. supply growth projects many years down the line. Some projects have been cancelled. Outside of small growth in Brazil and Russia, the rest of the world’s oil production will be on decline through 2022 and there is not much chance of anything changing this outlook. Also, even when there was over four years (2010-2014) of $100/Bbl oil, there were no major oil discoveries added. Outside of the U.S. “Shale Revolution”, the rest of the world reached “Peak Oil” in 2010 just as King Hubbert predicted that it would. The concept of “Peak Demand” for oil is total hogwash ginned up by the same people that think Tesla will take over the automobile market. Annual demand for oil has actually accelerated this decade. Demand for coal has declined, but demand for oil, natural gas and NGLs goes up year-after-year. “Demand for oil got off to a strong start this year with global 1Q18 growth at over 2 million barrels per day (YOY), helped by cold weather in the northern hemisphere. Recent data, however, points to a slowdown, with rising prices a factor. In 2Q18, growth slowed to 900,000 b/d (YOY). In 1H18, growth will average 1.5 million b/d, falling to 1.3 million b/d in the second half of the year. In 1H2019, the comparison with a strong 1H2018 will see growth of close to 1.2 million b/d, accelerating to 1.6 million b/d in 2H2019. 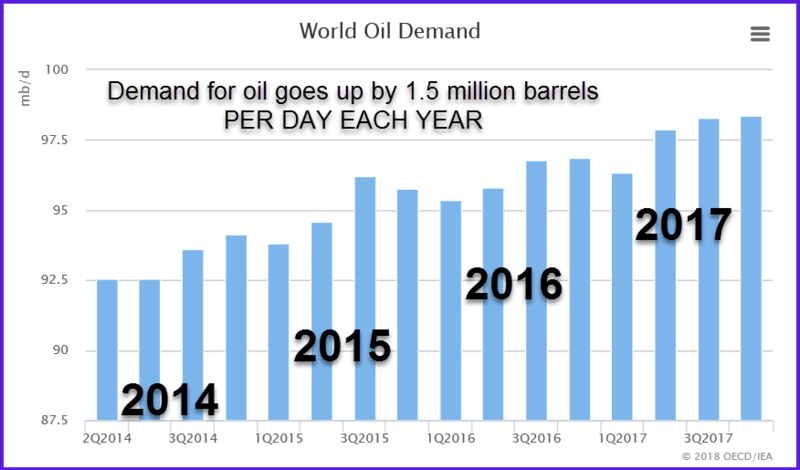 We expect growth of 1.4 million b/d in world oil demand in both 2018 and 2019, unchanged from last month's Oil Market Report.” - International Energy Agency 7-12-2018. The IEA has a long history of understating oil demand growth. From 2009 to 2015 IEA understated demand growth each year and had to revise up their demand “forecasts” upwards to actuals by an average of 490,000 BOPD. My forecast of actual demand growth being 1.5 million barrels per day year-over-year in 2018, 2019 and 2020 may end up being too conservative. With a strong global economy, demand for oil will probably increase closer to 2.0 MMBOPD in 2018. Consumption of oil based fuels and products is directly related to standard of living. Electric Cars reducing demand for gasoline is not a “Slam Dunk”, primarily because they cost too much and their limited range does not suit most drivers. Electric vehicles will have only minor impact on oil demand until AT LEAST 2025. 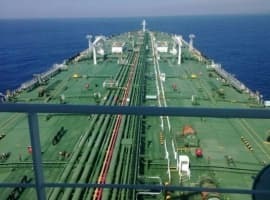 Conclusion: Global demand for oil exceeds supply by more than a million barrels per day as you read this article. 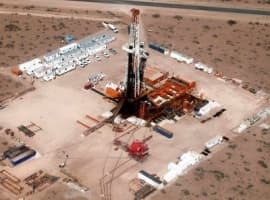 U.S. and OECD crude oil inventories will be declining to dangerous levels within six months and the price of West Texas Intermediate (WTI) is expected to average more than $70/bbl for at least the next three quarter. Chances are that conditions in Venezuela and the impact of U.S. sanctions against Iran will take another million barrels of oil supply off the market. My Prediction: Oil price cycles always overshoot the “Right Price” and we will see $100/Bbl oil in early 2019. Now is a great time to add more energy to your investment portfolio.